In the 1980s, the Fund for Theological Education (FTE) asked Justo González, the Methodist church historian and theologian, to do a study of Hispanic theological education, as part of a proposal to the Pew Charitable Trusts. The study found that, of the 230+ theological seminaries accredited by the Association of Theological Schools of the U.S. and Canada, only a handful had any Hispanic faculty at all. Latina/o ministers, seminarians, or college students interested in theology and religion had scant chance of ever studying with Hispanic scholars – or of getting an education connected to the Latina/o reality. The study persuaded Pew to grant resources to the FTE to fund exceptional Latina/o candidates in Masters and PhD programs in theology or religion. This project became our sister program, the Hispanic Theological Initiative, seeking to diversify U.S. graduate faculty ranks in theology & religion by increasing the quality, numbers, and percentages of Latina/o graduates from those programs. But what could and should be done before enough Hispanic scholars made it through their PhDs into the ranks of full-time, tenure-track faculty in predominantly white institutions? $50,000.00 of the Pew grant were then destined to create an annual, ecumenical, itinerant program, where a few of the extant Latina/o faculty in theology & religion would come to teach one course each, so that graduate students from all over the country could come and choose to study with one from several Latina/o faculty – more often than not for the first, and maybe the only time in their lives – enjoying fellowship with one another for two intensive weeks in the summer, in a program meeting in an institution of a different denominational family and region of the country each year. In the summer of 1989, the Hispanic Summer Program was held for the first time at Andover Newton Theological School, honoring the legacy of its just deceased Dean: the Rev. Dr. Orlando Costas, a true pioneer of U.S. Hispanic theology. Justo Gonzalez became its first Academic Director, while its funds were administered from the FTE offices by the Rev. Dr. Benjamin Alicea. Six years later, Justo wrote some 150 presidents, deans, and Hispanic faculty of a variety of schools and departments of theology in regions of the country with a large Hispanic population, asking them to invest in their own future by supporting the HSP with just over $12 a day ($4,500.00 a year). In exchange, besides the long term benefits inherent in the diversification of their faculty and students, the HSP would provide the students of those institutions with top quality, graduate-level summer credit courses, in both English and Spanish, with Latina/o graduate faculty, for a fraction of their actual cost. To everybody’s joyful surprise, the response to that proposal was enthusiastic, almost overwhelming. The first Governing Board of the HSP – one representative from each of the institutions which had already become HSP sponsors – met at Princeton Theological Seminary during the summer of 1995. 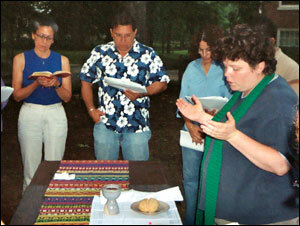 The Association for Hispanic Theological Education became then, until 2005, the managing agency of the HSP. Since 1989, over 1,000 Hispanic graduate students, and more than 100 non-Latinas/os, have taken near 150 courses at the HSP with no less than 100 different Hispanic faculty. From then on, near 40 other university departments of theology, seminaries, divinity and theological schools, Protestant, Catholic, Evangelical, and Pentecostal, have joined the roster of HSP sponsors. Thus, since 1989, over 1,000 graduate students, mostly Latinas/os, have studied at the HSP with near 100 Hispanic faculty, and many have gone on to join the faculty of many institutions across the Americas, to become ministers in a variety of churches and denominations throughout the continental U.S. and Puerto Rico; and/or to hold high administrative posts in their universities, seminaries, and denominations. At the onset of our second decade, an endowment was established in 1998 to ensure the continuity and financial health of our program. This permanent fund, currently managed by the Presbyterian Foundation � makes the HSP the only fully endowed Hispanic program in higher education in the U.S.
Self-managing, incorporated, and endowed, the HSP is entering now its third decade of existence. Truly, our history is barely beginning.